‘The vantage point we have at the top of the world gives us an opportunity to see things that we can’t see from other places,’ explains Lieutenant Colonel David Arnold, second in command at the base. But it’s this location that continues to rile the Russians. 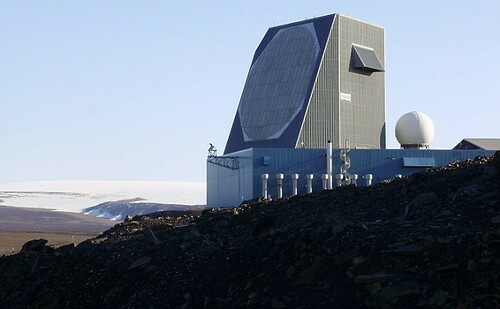 Even though the US maintains that the radar is directed at the new threat of ballistic missile attacks from rogue states like Iran and North Korea, the Russians remain suspicious – which makes Thule a potential flashpoint. The radar is currently being upgraded to play a key role in America’s controversial missile defence shield. This would allow Americans to not only track missiles but also shoot them down. The Russians have claimed this is a deeply aggressive move and in time-honoured fashion they responded by announcing plans – on the day after President Obama’s election – to position their own missiles in Kaliningrad, a small Russian enclave between Poland and Lithuania, and point them straight at US missile defence and radar bases. No final decision on the future of the defence shield has yet been taken by President Obama but it will be high on his agenda when he travels to Moscow in July. It remains both a major source of friction and a crucial bargaining chip between Washington and Moscow. It could yet be the front line of a new Cold War. This entry was posted on Thursday, April 16th, 2009 at 6:53 pm	and is filed under Uncategorized. You can follow any responses to this entry through the RSS 2.0 feed. You can leave a response, or trackback from your own site.